A predictable life isn’t all that bad. You know what to expect, you’re comfortable in the routine and it works to rarely step outside of something that you know is always going to be there. You have Tacos on Tuesday, you do laundry every Wednesday whether you want to or not and the floors get cleaned on Sunday. Predictability makes for less stress, without a doubt. Yet, life isn’t always in alignment with keeping it predictable. Our day to day existence can be thrown all over the map without a lot of effort, and having the ease of the expected sometimes can make those erratic days feel less of a burden. The same can be said about our meals too. I love variety in my kitchen, and will highlight the best of those recipes here for you to enjoy as well, but in addition to our stretching in the foods that we eat, we do a lot of repeats too; we make a batch of burgers, bake some chicken, cook up a pan of enchiladas, or jambalaya or stir up a large pot of different soups. I made a gorgeous pork tenderloin the other day, slathered in the roasted garlic mustard I made as Christmas gifts. It was lovely, but it was predictable, especially with the roasted potatoes on the side. And in going out for a meal, I love to experiment, to try out restaurants especially that serve ethnic cuisine I don’t to make at home. I love Indian food, and often leave it to the experts to create. Thai food, Chinese and Mexican are other cuisines I love to sample from restaurants. Sometimes they’re predictable, but I try to choose menu items that are unfamiliar so that I can experiment with other flavors and the different aspects of the culture. But then, there are those times when I just want something simple, something I know will deliver satisfaction and consistency, and stopping in Panera will give me just that. It’s not fancy, or lavish. It’s comforting and simple. Anyone can go there, from a 2-year old to the elders in your family. The selections are easy and familiar. You can count on the soups being warm and soothing, with a nice chunk of bread to dunk in, with a wide variety of good sandwiches and salads to satisfy everyone’s tastes. Their line of artisan breads are crackly on the outside, soft on the inside, and if baked goods and coffee are your thing, Panera offers lots of rich decadent options along with plenty of chewy bagels, and a bottomless cup of java to help you through the morning. WiFi is also available, and the stores are comfortable, and usually quiet enough for a few hours of work. Just recently on a chilly morning following church, Mike and I stopped in for some soup, and soon a bowl of their Creamy Tomato Soup was sitting in front of me, with a delicious Asiago cheese bagel on the side, to pull through the steaming bowl. The taste reminded me of being a kid, sitting at my Mom’s kitchen table with tomato soup and a grilled cheese, and I loved how it gave me that sense of comfort. There’s really nothing more to it than that; it’s predictable and widely available and always there, something you can count on. I was compensated for this post and my meal was complementary. influenced by Panera or their affiliates in any way. I’m remiss in giving some blog love to several wonderful products that have come my way recently. I truly love this aspect of food blogging. This past December, I participated in Season’s Eatings, a food exchange set up by my long time blogging friend, and former Minnesotan Katie, of Thyme for Cooking. Katie gathers bloggers from all over the world who send out food items native to their area or state. I’ve participated in previous years and the anticipation of what might show up in your mailbox is a great deal of fun. I nearly tackled the mailman almost every day once the deadline for shipping was past, in case he had a package for me. Good thing he’s got a sense of humor. 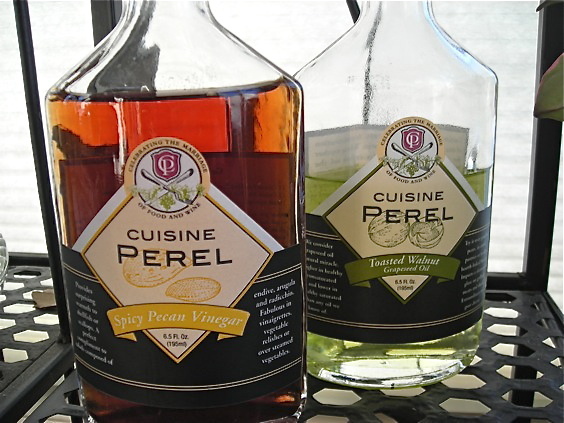 Finally, it arrived and I found two lovely bottles of specialty oil and vinegar from Nancy of A Wine Lover’s Wanderings. The Spicy Pecan vinegar, and Toasted Walnut oil combined beautifully with apples, walnuts and blue cheese crumbles to make a delicious salad for our Christmas dinner that unfortunately got gobbled up before a photograph occurred. My most humblest apologies to Katie because I seriously missed the deadline to get this up for her roundup at the end of December. And talk about being remiss…. 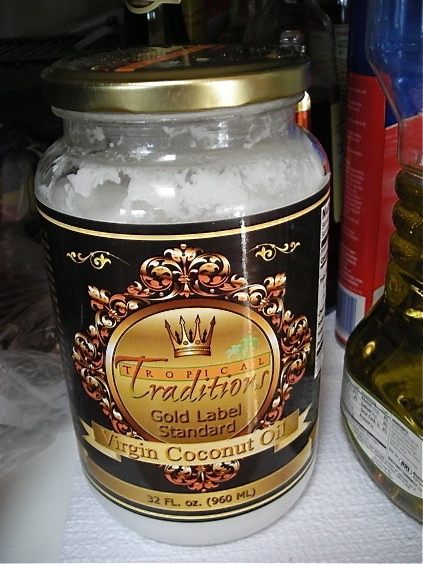 I probably received this Virgin Coconut Oil from Tropical Traditions sometime back in the Fall. It might have even been before that, so I am really apologetic about the delay in mentioning it. I’m always taken aback when ‘Samples’ get shipped to me because I’m thinking small, like the endless Sample bins at the drugstore where you can get tiny bottles of shampoo, mini toothpaste tubes and lotions that fit in the palm of your hand. Then this big honking jar of coconut oil shows up and wipes my mind clean of anything sample sized. A quart of coconut oil, and really, the only thing I’ve done with it, besides open the jar and inhale it’s tropical scent when the days are too cold and dreary, is to use it in my stove top popcorn popper. This product makes The. Best. popcorn I’ve ever tasted, and I have my fellow food blogger Crystal to thank for this discovery. Popcorn made with coconut oil pops up so crispy and light, with just the slightest hint of coconut flavor. Although I did taste some rich chocolate cookies made with coconut oil, my only love for this product at home has been through my popcorn cravings. Lastly, I was thrilled to receive an enormous shipment of Gold’N Plump’s new ground chicken products. Once again, I was awed at the generosity of the samples, all full sized. I received 8 pounds total; four packages of 95% fat free (95/5 on the label), and four of 90% fat free (90/10), in both standard packaging and in ‘chubs’, which makes me think of chubby baby thighs and cheeks. The meat is suited for use in any recipe where you would use ground beef, or even ground turkey. We’ve made burgers, which we loved, and a Meatloaf, which turned out beautifully. I’ll post the recipe very soon, I promise! They’ve tasted wonderful, and I love the lower fat content of the product. Ground beef never gets used in my kitchen, and it’s nice now to have some options instead of using ground turkey. and all reviews and thoughts are my own and do not reflect any company or product affiliation. There are lots of perks to this food blogging business. My most treasured aspect of it is how it challenges me to be a better cook, to think outside the box and to put together something that is fresh and interesting for my readers to find. I’ve driven myself out onto a proverbial ledge before with the utter exasperation over what people seem to find interesting when it comes to food blogs, how someone’s random post can garner 5o comments when it’s just a rehash of a ubiquitous dish, and then, I’ve just as quickly had to be coaxed back to reality, pushed down into my chair and told ‘Just cook what you want, and write about what you like and forget everything else’ and so then I did, and that, my friends and readers, turns the entire project around. This little corner of the blog world is just what I want it to be. Nothing more. Then there’s you, readers. I love your visits, comments and feedback. I do this for you and mmmmmuah….big cyber kisses! And lots of thanks. You all keep me going, every day. With every recipe I peruse, every book I thumb through and magazine pages that I absorb, I am constantly thinking ‘Yes, but will they LIKE it? Who’s done it already? Is it something unique?’ because really, the last thing I want you to find here is the same old, same old you can come across in the staggering amount of sites that are out there. My words, and my food, should be the draw. I intend to keep it that way. And lastly, mostly in terms of importance, there’s the free product offers that land in my mailbox. All. The. Time. I get a LOT of offers for free product. Some of them… ok, most of them are refused. I won’t accept a product if it’s not something I would normally use at home. And if it isn’t food related, forget it. I won’t link to your tire superstore, no matter how good your prices are, and I don’t care about the resurgence of absinthe enough to warrant taking a free bottle. Recently though, I did get some nice options sent my way. I’ve been on the receiving end of this delicious jerky before, so when contacted a second time for more product to review, it was a no brainer. The Teen, my little carnivore, he just loves the stuff, and when he came home from school and saw the packages lying on the counter, he grabbed one and ripped it right open, gleefully pulling out a nice thick chunk and ripping one end of it off with his teeth. The boy knows how to seriously attack his jerky. He chewed contemplatively, then stuffed the rest in his mouth. “Well? ?” I asked him. He swallowed again and grabbed his water glass, gulping down a mouthful. Then he turned to me with a smile. I was sent a sample of the Orange and Mango flavored, sweet and spicy indeed. 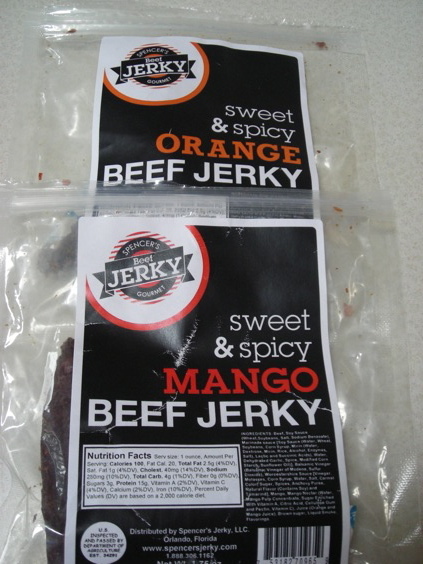 Both have such good smoky flavor, and the jerky is firm and well made, dry but not hard, chewy and tender at the same time. The Orange taste is prominent in the first bite, with a good snap and a nice dose of heat on the tongue. The Mango is a sneaker; the flavor doesn’t really hit your mouth until you swallow your first bite. The spice dissipates and you get fresh mango all around. It sounds strange, and I am often wary of the pairing of fruit and meat, but these two work together. And if you’re at all interested in jerky, but are looking for something other than beef, they do plenty with turkey as well. Turkey jerky- it’s even fun to say! Another offer that came my way recently was from Pillsbury, and since I’m a true Minnesota girl at heart, I do consider their offers, and they have been quite kind to me in the past. The canvas totes I received from them are the ones most often tucked under my arm when I head into the grocery store, and in this particular email, my contact wanted to send me free pajama pants. Oh hello, my easy like Sunday morning. And that was the whole idea, to make Sundays easier. But on Sunday, we’re out the door by 8:15 for church. There’s no sitting around until noon, comfy in pj’s, cozy with a cat. That’s for Saturday, because it’s true……. Cute, huh? They’re 100% cotton and so big and roomy that comfort becomes my middle name when I have them on. And these are that brand of comfort that we all love, the ‘I never want to get out of these’ kind that’s perfect for my Saturday, the day the guys sleep in while I answer the Cat Alarm clock that bounces over me at the crack of dawn. And now, back to our regularly scheduled blogging. Brought to you in living health, with delicious aromas, by yours truly. I always love the free product offers that come my way due to this food blog, but the fact is, I turn down way more of them than I actually accept, mostly because the product offered just isn’t one that I would use. 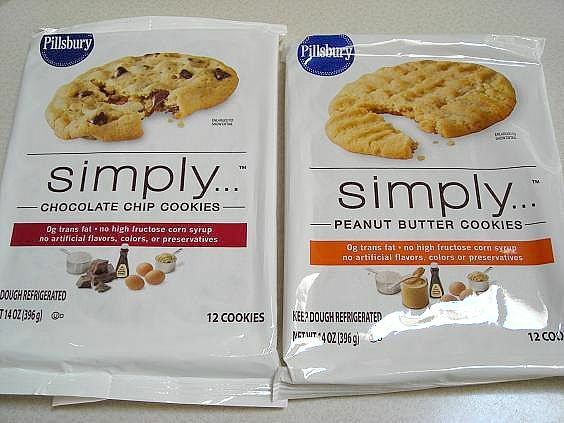 This cookie dough from Pillsbury, however, is one of those that had me firmly on the fence. I decided that it would be worth a least a respectable glance, and you certainly can’t argue with ‘Free’. I grew up with scratch cookies that my Mom made. We never ate anything store-bought, and even now I rarely, if ever, buy store cookies. In keeping the right kinds of ingredients on hand, I can have a batch of warm cookies in about a half hour, and I know I don’t even have to tell you a thing about the superior flavor of a home-baked cookie. But this product did intrigue me because it claimed to be nothing more than your basic cookie dough- no additives, preservatives or funny chemicals that you can taste even through the glass of milk that you drink to wash down your warm cookie. 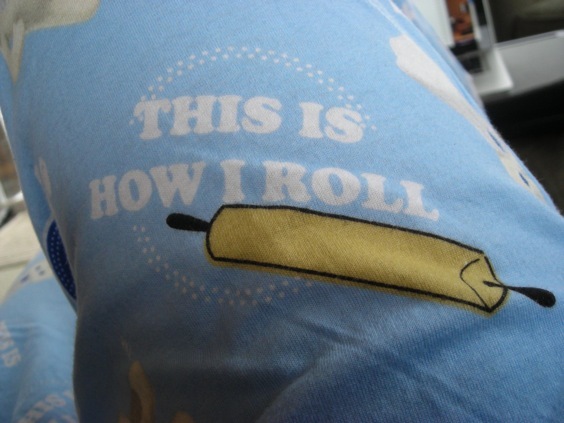 And Pillsbury delivers on that. The ingredient list reads like any recipe should- flour, butter, eggs, baking soda, salt….your basic mix. The cookies come in two flavors- Peanut Butter and Chocolate Chip and I was sent two free vouchers, plus some really nice, sturdy canvas bags and a full informative press kit. My local grocer had the cookie dough on sale as well- two packages for $5.00, with each package containing 12 pucks. I bought four, essentially getting half for free. I baked a package of each cookie right away. The day was a bit warm and the dough sat out on the counter for maybe 10 minutes before I placed the pucks on sheets and they had become quite soft. The cookies were pretty flavorful but I detected an off flavor in the chocolate chip version, owing to what I think is an inferior chip. They aren’t bad, but when you’re used to Guittard or Ghiradhelli chips in your cookies, anything else can seem pretty bland. I did, however, really like the peanut butter cookie. I’ve always enjoyed a good peanut butter cookie but tend to be put off by the usual grainy or chalky texture they tend to have; this one had none of that, just good clean peanut butter taste. I wouldn’t buy these for home use, but they would be a really good option for us to have on hand at our lake home for a quick treat. They’re simple to use and bake, and keep in the freezer for up to 60 days. Price-wise, even at $2.50 per package I think it’s too expensive, coming out to be $0.21 per cookie. You can make them from scratch for pennies. The product is geared towards your everyday ‘Busy Mom’ who wants to offer home-baked taste without a fuss. As fas as pre-made products go, these are a very good option that you can feel good about serving, really the nicest and most flavorful of any pre-made cookie dough I’ve had and that’s fine if it’s your thing, but it isn’t mine. I’m happy to tell others about it though!